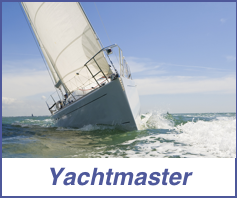 A RYA Yachtmaster™ Certificate of Competence is often the ultimate aim of aspiring skippers. It is a well known, highly respected professional qualification, recognised worldwide, proving your experience and competence as a skipper. This course is tailormade to prepare candidates for the RYA Yachtmaster Coastal or Offshore practical examination. Content is tailormade for each candidate and can cover any element of the Yachtmaster shorebased or practical syllabus. Ability after the course: Ready to take the Yachtmaster Practical Examination. Any candidate that needs further training will be informed by their Instructor. Yachtmaster Coastal: 30 days, 2 days as skipper, 800 miles, 12 night hours (if you hold the Coastal Skipper course completion certificate this is reduced to 20 days, 2 days as skipper, 400 miles, 12 night hours). Half the qualifying sea time must have been in tidal waters. Yachtmaster Offshore: 50 days, 2,500 miles including at least 5 passages over 60 miles measured along the rhumb line from the port of departure to the destination, acting as skipper for at least two of these passages and including two which have involved overnight passages. 5 days experience as skipper. At least half this mileage and passages must have been in tidal waters. All qualifying sea time must be within 10 years prior to the exam. Candidates must have navigation knowledge to the level of the Yachtmaster Shorebased course. Candidates must also hold a recognised VHF radio certificate and a recognised First Aid qualification.